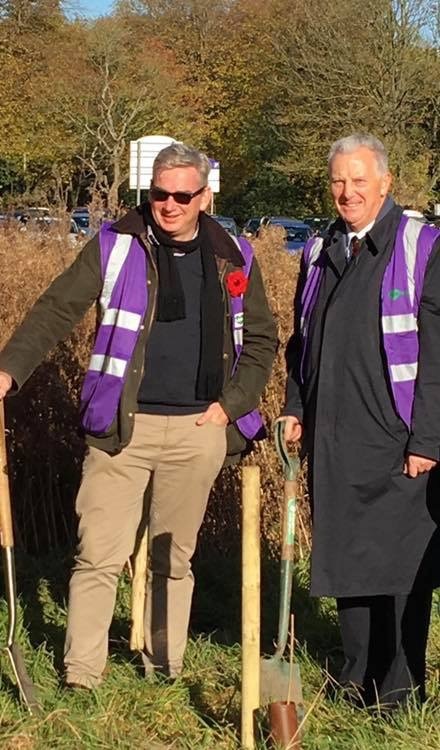 Councillor Joe Tildesley, Solihull Council’s cabinet member for Leisure, Tourism and Sport, and local MP Julian Knight planted five trees in Brueton Park on Friday 2nd November as part of the Queen’s Commonwealth Canopy Project. Two silver birch trees, two rowan trees and one hazel tree were planted close to Brueton car park. The same varieties of trees will be planted at 10,000 locations across the UK in a project co-ordinated by the Woodland Trust. The planting in the park was organised by Love Solihull – Solihull Council’s environmental initiative and supported by Glendale. The Queen’s Commonwealth Canopy aims to support indigenous forests all over the commonwealth by planting native trees in key areas. This will help to combat the effects of climate change and create a lasting physical legacy of the Queen’s leadership of the Commonwealth. Cllr Tildesley said: “The Queen’s Commonwealth Canopy is an excellent environmental project and one that the Council is proud to be involved with. Planting these trees in Brueton Park was a wonderful opportunity to play a small part in a huge global initiative. Julian Knight MP said: “I am very grateful to the Woodland Trust for gifting me these lovely saplings, and glad to plant them here in Brueton Park as part of the Queen’s Commonwealth Canopy programme.